These days everything seems to take me a long time to manifest. Kids, making a living, maintaining the farm, all demand a certain amount of time and energy, so getting to projects or developing new skills is low on the list of to-do’s. But, little by little, we come closer to living an industry free existence. Where everything we consume, our house and how we live is directly from the land, and made by hand or from people we know. One of the many things on my list to learn, towards living a good hand-made life, is making furniture. 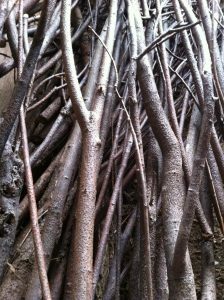 Last spring, after many years of thinking about it, I decided to start the process of making rustic willow furniture. I had helped someone years before, and she’d shown some things about chair building. 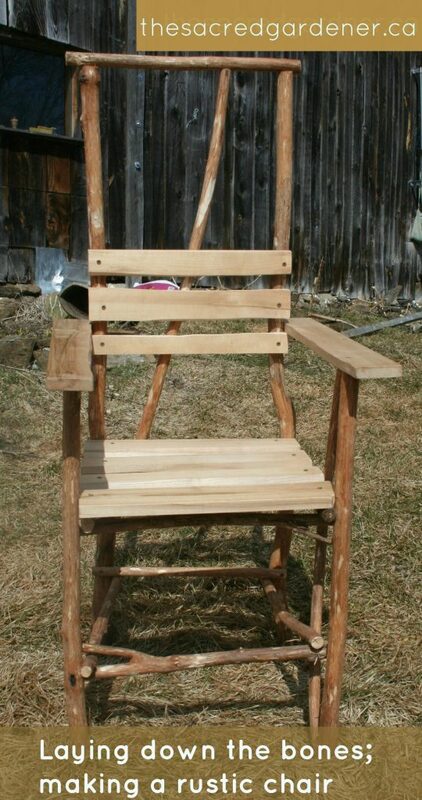 One thing I remembered was that much of the chair should be made from dry wood. So, last spring, just after the thaw, I went out, did some offerings and then cut down a dozen or so Willows for the furniture. I chose willow because there are lots of them around and I know Her medicine well. She is strong but flexible. Her medicine has helped me in fever and pain, and I’ve weaved many baskets with Her. 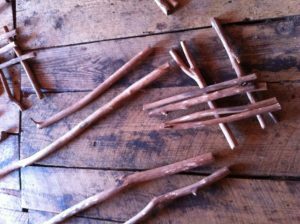 I also knew, as a bonus in cutting the trees last year, was that this year I would have many long strait ‘sucker’ canes to harvest for basket making. I harvested the trees and then piled them up off the ground outside to dry. At the end of the summer I dragged them back to the farm and put them in the barn, where I would be able to work with them in the winter. But, the winter was so long and unrelenting I never felt motivated to go out and work on the furniture. This spring, when it turned a bit milder, I finally did get a day here and an afternoon there. I cut and stripped enough wood pieces for four chairs. I had a full day to myself, and so I laid out the pieces for building the chair. The power of it hit me right away, the pieces were like BONES. Carefully setting them out like a skeleton was like a magic incantation. I felt the sacredness of what I was doing and made some offerings and prayers for all those involved in creati ng this ‘chair’ being. 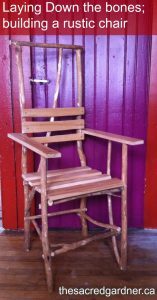 As I built the chair, the analogy of it, not only reflecting, but containing me was ever present. As I put Her bones together, each cut and joint mirrored my own. The length of Her bones was the length of my bones! She had to be built that way to fit me. I matched the bones two by two and in groups of four. 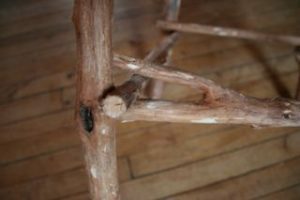 The dimensions and number of parts that ‘is’ a chair, like our own bones, embodies profound personal and universal significance. Chairs are altars that contain the alchemic code for humans. They are thrones of power mean t to hold our bodies up and at the same time sacredly connect us with the Earth through the four pillars of life, the four directions. 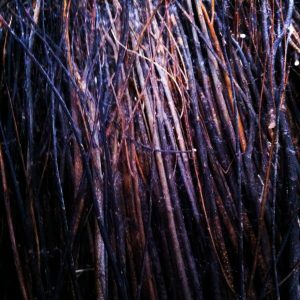 As I balanced and danced the pieces of willow into a chair, She began to come alive. She was kicking and buckling like a gazelle, caught in a square corral. The pieces of Her strained against their domestication. But, with care and patience, like an animal she came around, happily settling into her new purpose and form. While building the chair, I remembered back twenty some years ago to a friend and teacher of mine, Tim Whitten, who did many art pieces based on chairs. He’d talked about how profound a metaphor chairs were. And while I understood him intellectually at that time, I didn’t really understand him in my body. As with many things, I had to do it with my own hands to really get it. I was reassured by this memory and thought that our purpose here at The Sacred Gardener is so valuable. To teach and give people the chance to learn things in a hands-on way. 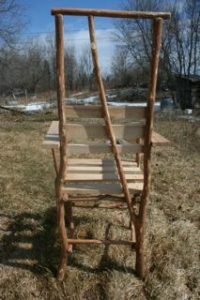 Now, this chair, like our food, medicine, our house and many other parts of our life, will help me be more connected with the Earth and with my community and ancestors. When I sat on our IKEA chairs, not only was I disconnected with the Earth literally by a couple feet, but also symbolically my loyalties and support were unwittingly spread far and wide, from Sweden to China where the chairs were made. Now when I sit I’m not leaving the Earth behind, I’m directly connected with the land and the flowing creek the Willows grow by.